Vincent J. Borne is a lifelong resident of Franklin, Louisiana, in St. Mary Parish. He graduated from Hanson Memorial High School in 1990. After high school, he attended Louisiana State University graduating with a Bachelor of Arts degree in Political Science in 1994. After graduating from LSU, he attended Loyola Law School in New Orleans, Louisiana, graduating with a Juris Doctor degree in 1997. He was licensed to practice by the Louisiana Supreme Court in 1997. Judge Borne is married to Robin Fitzgerald and they have three sons. The Borne’s are active members of the Church of Assumption in Franklin. In 2013, Judge Borne was elected for the Sixteenth Judicial District, Division C, and took office on March 1, 2013. 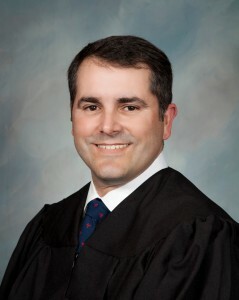 Prior to becoming a District Court Judge, Judge Borne was an Assistant District Attorney for the Sixteenth Judicial District from 1997 to 2013.